Time for another UK release! The UKers get to hit the finish line first! Digimon Adventure tri. Part 6 Future came out in the UK a day before the US release. In fact, this release just came out today in the UK! In addition, a slight change to Digimonukkah 2018. At this point it appears there will in fact be little gifts all 8 days! I did some editing on these... and no scanning, because I didn't get the UK release (gotta decide where that money needs to go.) Thanks to forum member Kai, we have these images because he scanned them on his own and shared them to make sure the UK release could get featured, the same way we try and do for media whenever possible. So big thanks to Kai for putting in the time and effort. Most of what I did here was reorienting, cropping, and some editing. The scanner used was more meant for scanning documents and further editing likely would have made the final images look worse. I did a bit more editing than I normally do for the UK breakdowns due to some scanning issues, and a bit of physical damage to the packaging. I'm not going to to go over tri. Part 6 itself, but I will do that once I have the US disc in hand. The first thing worth mentioning is the UK Blu-ray release does not include a DVD like the US release did. So if you want the release on DVD, you'll need to get the standalone DVD version. The Blu-ray is labeled as a collector's edition, the DVD is not. In addition, the packaging identifies the title of Part 6 as 'Our Future', using the full Japanese title instead of 'Future' as has been used in all English marketing of Part 6. 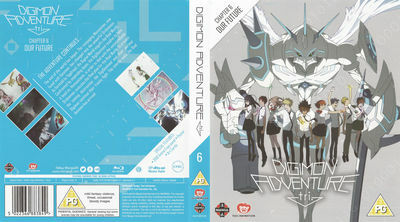 The front cover of the collector's edition slipcover (at the top) is the second theatrical poster for tri. Part 6 in Japan. The cover looks very nice overall. The primary disappointment is that it doesn't match with all (but the 1st) UK releases in using the Japanese home video covers. 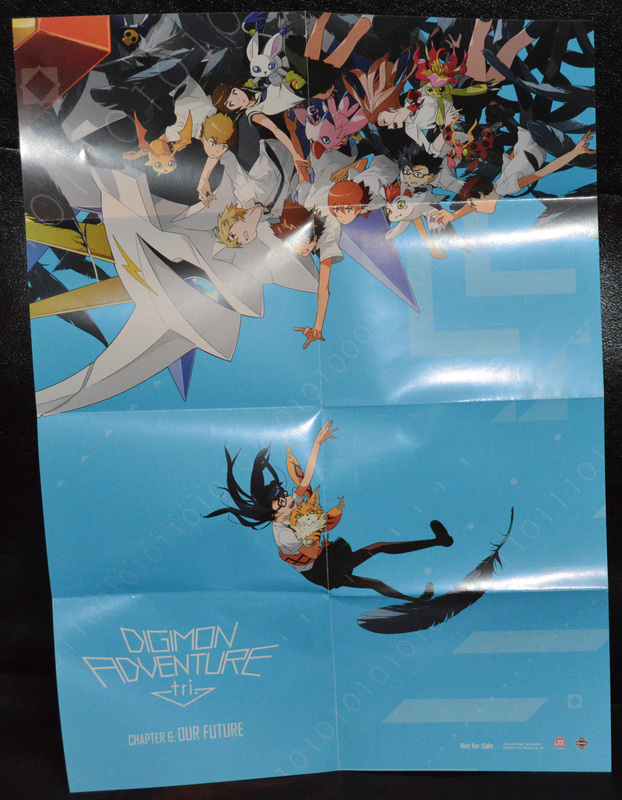 The back of the slipcover is very clean. 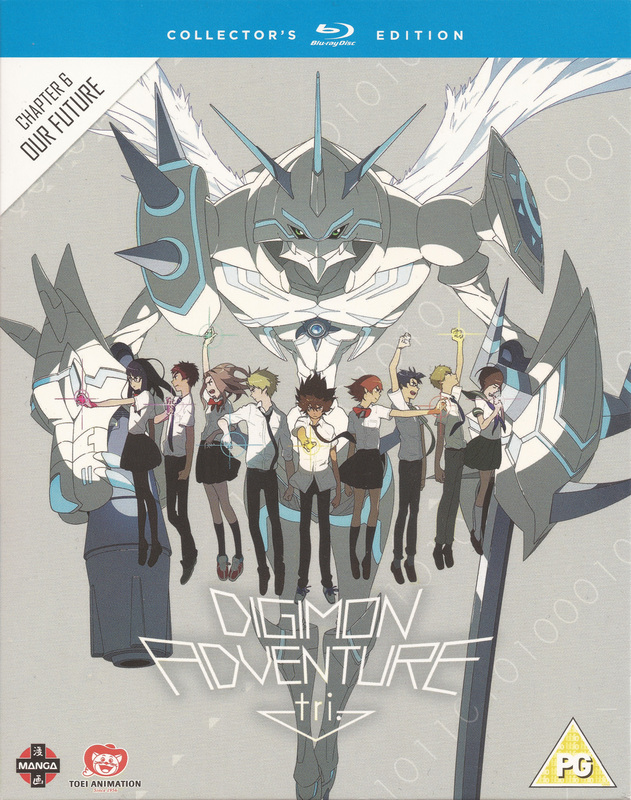 In a number of ways it feels like this back cover was based off the digital motif used in the Japanese release. While it has a nice overall look, I'm still not sure I like the text and screencaps at an angle like that though. The blue and white go with each other quite well and is pleasant to look at. The back also has extras listed, along with various technical specs. The spine of the slipcover looks nice. The number on the blue lines up perfectly with how prior releases used grey, green, yellow, red, and pink. The actual BD cover insert itself is basically what you expect, roughly the same as what was used on the slipcover, just in insert form. And the insert is reversible! 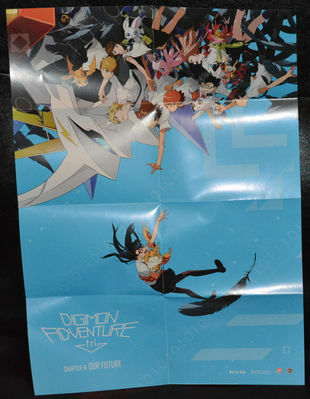 This one uses the first theatrical poster from tri. Part 6, and uses different logo placement than the Shout release. In addition, due to the different logo placement. It looks very nice and there are far less logos and other required things, since this cover won't ever be consumer facing in stores. The back cover also inverts the colors of the background.) It's a very nice looking cover, and I wouldn't be shocked if many people swap their covers to this version (especially since the main cover is nearly 1:1 to the slipcover.) Swapping all 6 covers would mean you get the primary theatrical posters for each release as the cover of yours. The disc looks very nice and clean. It has the various logos on it, but otherwise sticks to the tri. style motif that is used elsewhere in this release (which was originally used in various Japanese tri. releases.) 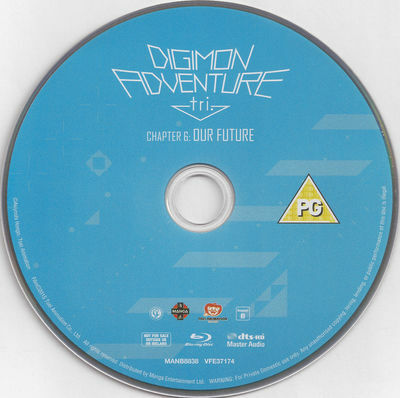 The grey-blue used for the digital motif appears more visible than in some of the prior UK releases. The release also includes a few physical extras. These four art cards use different group shots this time. We get a group shot of the Digimon, then a group shot of the kids. Then we get an image using the kids profile artwork. 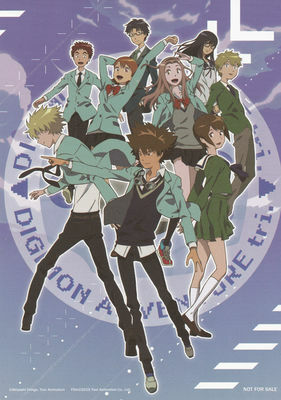 This same art is being used in the UK collection of tri. The last art card will be familiar to fans. It originally showed up in an issue of Animedia, and was later announced as the cover to Part 3 in the UK before it was swapped out for different art. Having it show up in the UK release of tri. acts as a tiny easter egg for fans who have been paying attention to release news. The other extra is a poster. I can't go over the on disk content in detail since I don't have it, but I can go over the few things I do know. Audio is listed as being DTS-HD Master Audio, which is lossless, for both Japanese and English audio. It is also listed as having English subtitles. 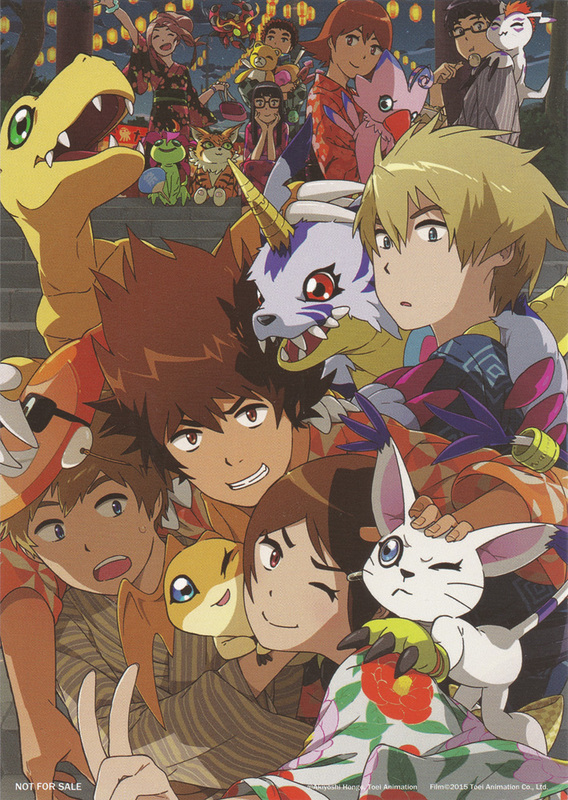 We get the Digimon panel from Anime Expo 2018. And I don't have the US release yet to write my thoughts on it, so I'll wait to add them properly until I've seen it. That's it for this one. The UK release, packaging wise, is pretty nice, if it had a few odd decisions. If you prefer art cards, a reversible cover, and a poster, the UK one is better. If you prefer a DVD and digital copy the US one is better. I think there are likely arguments to be made about either one. 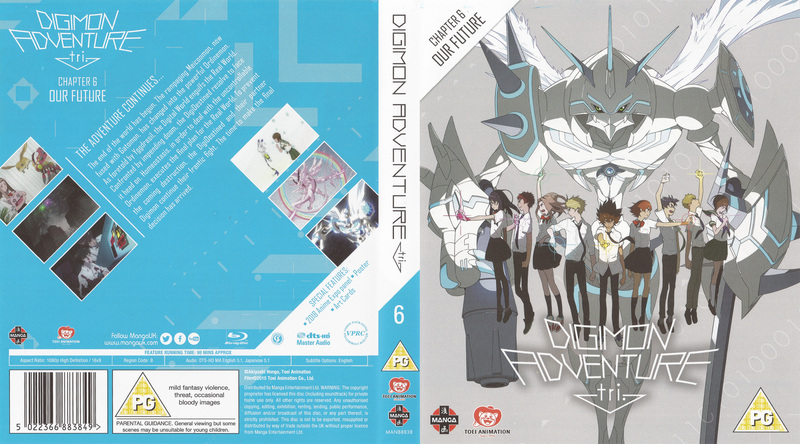 Part 6 is the last release for tri. 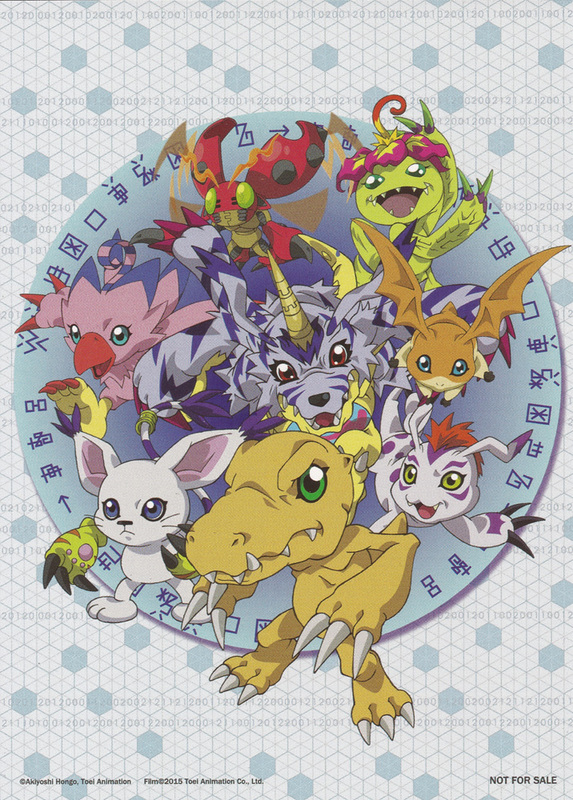 in the UK (not including the collection or any future re-releases) and despite early delays with Part 1, the UK releases have generally gone smoothly for the UK, which often hasn't been true for Digimon releases in the UK. Big thanks again to Kai for the scans, which can be found in our gallery. If you have any questions about the release feel free to ask, we have quite a few members from the UK and I'm sure they'd be willing to answer questions from those of you trying to decide if you should buy the release. 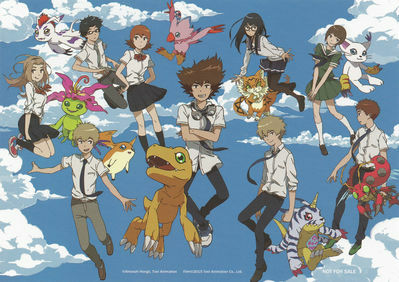 There is also a discussion thread for the English release of tri. Part 6 here. If I'm able to in the future I will attempt to get ahold of a copy of the disc to expand the breakdown, similiar to what I would normally do. Our friends in Australia will be getting tri. Part 6 in March and details about that can be found here. 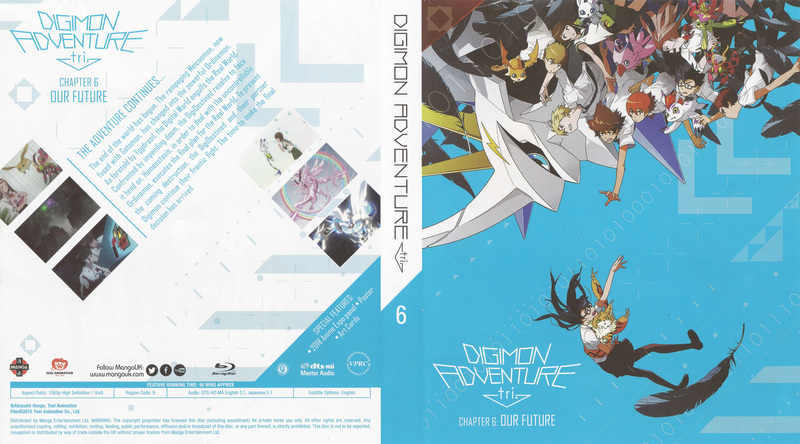 The breakdown/scans/screenshots of the USA Blu-ray/DVD/Digital release will be made available as soon as is possible.